US, 1952, 85 minutes, Black and white. Gene Barry, Lydia Clarke, Lee Aaker, Michael Moore. 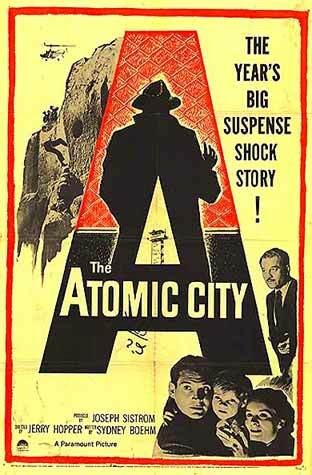 Atomic City is a routine B-budget thriller of the early 50s. It received very good reviews - for its tension and pace as well as for its highlighting of nuclear themes. Director Jerry Hopper made many successful though routine action thrillers during the 50s before moving to television. 1. This film was a B-picture. Its quality as a B film? Acting, plot, locations, musical background? 2. The importance of the introduction and the setting of Hiroshima and bombings? The 'anti-death' tone of the introduction? As a reflection of the early 50s now? The comments on the use of atomic power and the abuse of it? 3. The setting of the city and the background of security? The isolated city, the impact on social life, e.g. the television, the carnival, school etc.? 4. How well did the film elicit interest in and sympathy for the family? Sympathy, then, for the boy and his being kidnapped? The plight of the parents? 5. How well did the film make the transition to a kidnap thriller? Its means of generating suspense? The feelings of the family, the decisions of the father in terms of security, the various social issues in a patriotic America? The clash of human feelings for family and patriotism? 6. The picture of the police and the detailed work as regards finding the boy? Trailing people and the detail of surveillance? The film, the undercover men, the interrogations of suspects etc.? How successful and interesting as a police drama? 7. Audience sympathy for the boy himself? As the average American boy? As a victim of the kidnappers? As having initiative in trying to escape? 8. The picture of the criminals: the varying types, their behaviour, being followed by the police, deaths such as the car explosion? The final chase? 9. How plausible was the pursuit in the caves? The generating of suspense and tension? The details of the rescue? How well done was the suspense, even if success was inevitable? 10. What is the effect of this kind of film in terms of testing audiences response, feelings, values?